When Pizza Hut failed to brings its oft-discussed pizza perfume to full retail reality, it seems a space was created in the eau de food space-time continuum, waiting for some other product to waft in and fill the void. 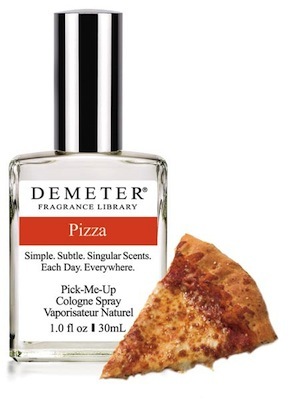 So of course, one company did, and thus we have $20 1-ounce bottle of pizza perfume on the market. Yeah, or for the hungry who just can’t be eating pizza all day, every day because some people in society frown on that. Stupid society. Anyway, Gothamist checked out a bottle of it and it sounds like the reviews are a bit mixed. On the one hand, pizza! On the other, smelling like you rolled around in pizza! “It’s like what living with the Teenage Mutant Ninja Turtles must smell like,” one staffer notes. I don’t know if I’m intrigued, scared or hungry. Or all three. Someone hold me. And bring pizza.